A abelha Bombus terrestris é um excelente polinizador, prestando importantes serviços ecossistêmicos na Europa e adjacências, onde a espécie é nativa. Contudo, foi criada em larga escala para uso em polinização em ambientes protegidos por empresas especializadas, é vendida para vários países do mundo. São crescentes os relatos de invasão da espécie em áreas fora de sua distribuição natural, onde tem competido com outras abelhas na busca por recursos florais. Bombus terrestris foi introduzida no Chile para polinização agrícola, mas já pode ser encontrada vivendo livre na natureza na Argentina. Porém, o conhecimento sobre as interações locais com plantas e com as outras espécies de abelhas do gênero Bombus nesse novo ambiente ainda é escasso. Por meio de modelos bioclimáticos e análises biogeográficas, foi possível estimar as prováveis rotas por onde a espécie poderá deslocar-se na America do Sul. Uma ênfase foi dada ao território brasileiro. The bumblebee Bombus terrestris is an excellent pollinator, providing important ecosystem services in Europe and surroundings, where this species is native. However, it is reared in large quantities for use in greenhouse pollination by specialized companies that sold colonies to many countries around the world. There are reports of invasion of this species into areas outside its natural range, in which this bee has become a competitor with other local bees in search of floral resources. Bombus terrestris was introduced in Chile for agricultural pollination, but it can be found freely in nature in Argentina. Nevertheless, the knowledge about the interactions with plants and with other local bee species of the genus Bombus in this new environment is still scarce. Through bioclimatic models and biogeographic analysis, it was possible to estimate the likely routes by which this bee species can move in South America. An emphasis was given to Brazilian territory. BEEKMAN, M.; LINGEMAN, R.; KLEIJNE, F. M.; SABELIS, M. W. Optimal timing of the production of sexuals in bumblebee colonies. Entomologia Experimentalis et Applicata, v. 88, n. 2, p. 147-154, 1998. BEYER, H. L. Hawth’s Analysis Tools for ESRI’s ArcGIS (v3.26). 2006. Disponível em: <http://www.spatialecology.com/htools>. Acesso em: 5 janeiro 2010. BUCHMANN, S. Buzz pollination in angiosperms. In: JONES, C.; LITTLE, R. (Ed.). Handbook of experimental pollination biology. New York: Van Nostrand Reinhold Company Inc., 1983. p. 1-274. CHAPMAN, R. E.; WANG, J.; BOURKE, A. F. G. Genetic analysis of spatial foraging patterns and resource sharing in bumble bee pollinators. Molecular Ecology, v. 12, n. 10, p. 2801-2808, 2003. DAFNI, A. The threat of Bombus terrestris spread. Bee World, v. 79, n. 3, p. 113-114, 1998. DAFNI, A.; KEVAN, P.; GROSS, C.; GOKA, K. Bombus terrestris, pollinator, invasive and pest: An assessment of problems associated with its widespread introductions for commercial purposes. Applied Entomology and Zoology, v. 45, n. 1, p. 101-113, 2010. DAFNI, A.; SHMIDA, A. The possible ecological implications of the invasion of Bombus terrestris (L) (Apidae) at Mt Carmel, Israel. In: MATHESON, A.; BUCHMANN, S. L.; O’TOOLE, C.; WESTRICH, P.; WILLIAMS, I. H. (Ed.). The conservation of bees. London: Academic Press, 1996. DE MARCO, P.; COELHO, F. F. A time Bombus about to blow: Niche based models for worldwide invasion by Bombus terrestris. Biological Invasions, em revisão. DONOVAN, B. Interactions between native and introduced bees in New Zealand. New Zealand Journal of Ecology, v. 3, p. 104-116, 1980. ELITH, J. et al. Novel methods improve prediction of species’ distributions from occurrence data. Ecography, v. 29, n. 2, p. 129-151, 2006. ESRI. ArcMap 9.2. USA: Environmental Systems Research Institute, 2006. EVANGELISTA, P.; KUMAR, S.; STOHLGREN, T.; JARNEVICH, C.; CRALL, A.; NORMAN III, J.; BARNETT, D. Modelling invasion for a habitat generalist and a specialist plant species. Diversity and Distributions, v. 14, n. 5, p. 808-817, 2008. FICETOLA, G.; THUILLER, W.; MIAUD, C. Prediction and validation of the potential global distribution of a problematic alien invasive species - the American bullfrog. Diversity and Distributions, v. 13, n. 4, p. 476-485, 2007. FREITAS, B. M.; MARTINS, C. F.; SCHLINDWEIN, C. Bee Management for Pollination Purposes - Bumblebees and Solitary Bees. Ministry of Environmet - São Paulo University, 2003. Disponível em:<http://webbee.org.br/bpi/breno.htm>. Acesso em: 2 julho 2010. GAULD, I. D.; COLLINS, M. N.; M.G., F. The biological significance and conservation of Hymenoptera in Europe. Strasbourg: Council of Europe, 1990. GLC. The Global Land Cover for the Year 2000. 2003. Disponível em: <http://www-gvm.jrc.it/glc2000/defaultGLC2000.htm>. Acesso em: 5 janeiro 2009. GOKA, K. The European bumblebee Bombus terrestris and invasive alien species act. The Nature and Insects, v. 41, n. 12, p. 22-26, 2006. GOULSON, D. Effects of introduced bees on native ecosystems. Annual Review of Ecology Evolution and Systematics, v. 34, p. 1-26, 2003. ______. Bumblebees - Behaviour and Ecology. 2nd. ed. Oxford: Oxford University Press, 2010. GOULSON, D.; HANLEY, M. E. Distribution and forage use of exotic bumblebees in South Island, New Zealand. New Zealand Journal of Ecology, v. 28, n. 2, p. 225-232, 2004. GOULSON, D.; HUGHES, W. O. H.; DERWENT, L. C.; STOUT, J. C. Colony growth of the bumblebee, Bombus terrestris, in improved and conventional agricultural and suburban habitats. Oecologia, v. 130, n. 2, p. 267-273, 2002. GOULSON, D.; STOUT, J. C. Homing ability of the bumblebee Bombus terrestris (Hymenoptera: Apidae). Apidologie, v. 32, n. 1, p. 105-111, 2001. 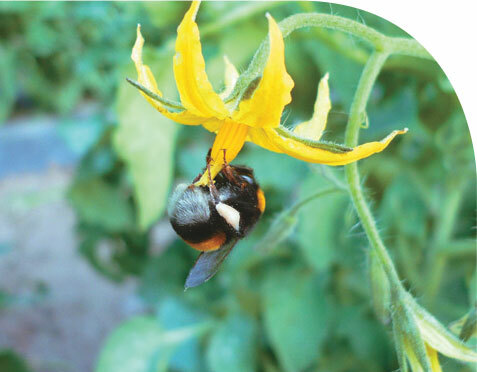 GRIFFITHS, D. A critical study on the introduction onto mainland Australia of the bumblebee Bombus terrestris for the commercial pollination of protected tomato and other crops. Practical Hydroponics and Greenhouses, v. 77, p. 42-59, 2004. HASSELROT, T. Studies on Swedish bumblebees (genus Bombus Latr. ): their domestication and biology. Opuscula Entomologia, v. XVII, p. 1-192, 1960. HEINRICH, B. Bumblebee economics. Cambridge: Harvard University Press, 1979. HERNANDEZ, P.; GRAHAM, C.; MASTER, L.; ALBERT, D. The effect of sample size and species characteristics on performance of different species distribution modeling methods. Ecography, v. 29, n. 5, p. 773-785, 2006. HINGSTON, A. B. Does the introduced bumblebee, Bombus terrestris (Apidae), prefer flowers of introduced or native plants in Australia? Australian Journal of Zoology, v. 53, n. 1, p. 29-34, 2005. HINGSTON, A. B.; HERRMANN, W.; JORDAN, G. J. Reproductive success of a colony of the introduced bumblebee Bombus terrestris (L.) (Hymenoptera : Apidae) in a Tasmanian National Park. Australian Journal of Entomology, v. 45, p. 137-141, 2006. HINGSTON, A. B. et al. Extent of invasion of Tasmanian native vegetation by the exotic bumblebee Bombus terrestris (Apoidea : Apidae). Austral Ecology, v. 27, n. 2, p. 162-172, 2002. HOLM, S. N. Experiments on the domestication of bumblebees (Bombus Latr.) in particular B. lapidarius and B. terrestris L. Arsskr. K. Vet. Landbhojsk, n. 1-19, 1960. HOWLETT, B.; DONOVAN, B. A review of New Zealand’s deliberately introduced bee fauna: current status and potential impacts. New Zealand Entomologist, v. 33, n. 1, p. 92-101, 2010. INARI, N.; NAGAMITSU, T.; KENTA, T.; GOKA, K.; HIURA, T. Spatial and temporal pattern of introduced Bombus terrestris abundance in Hokkaido, Japan, and its potential impact on native bumblebees. Population Ecology, v. 47, n. 1, p. 77-82, 2005. INOUE, M. N.; YOKOYAMA, J.; WASHITANI, I. Displacement of Japanese native bumblebees by the recently introduced Bombus terrestris (L.) (Hymenoptera : Apidae). Journal of Insect Conservation, v. 12, n. 2, p. 135-146, 2008. INOUYE, D. The terminology of floral larceny. Ecology, v. 61, n. 5, p. 1251-1253, 1980. KADOYA, T.; ISHII, H. S.; KIKUCHI, R.; SUDA, S.; WASHITANI, I. Using monitoring data gathered by volunteers to predict the potential distribution of the invasive alien bumblebee Bombus terrestris. Biological Conservation, v. 142, n. 5, p. 1011-1017, 2009. KANBE, Y.; OKADA, I.; YONEDA, M.; GOKA, K.; TSUCHIDA, K. Interspecific mating of the introduced bumblebee Bombus terrestris and the native Japanese bumblebee Bombus hypocrita sapporoensis results in inviable hybrids. Naturwissenschaften, v. 95, n. 10, p. 1003-1008, 2008. KEARNS, C.; THOMSON, J. The natural history of bumblebees: a sourcebook for investigations. Boulder: University Press of Colorado, 2001. KONDO, N.; YAMANAKA, D.; KANBE, Y.; KUNITAKE, Y.; YONEDA, M.; TSUCHIDA, K.; GOKA, K. Reproductive disturbance of Japanese bumblebees by the introduced European bumblebee Bombus terrestris. Naturwissenschaften, v. 96, n. 4, p. 467-475, 2009. KRAUS, F.; WOLF, S.; MORITZ, R. Male flight distance and population substructure in the bumblebee Bombus terrestris. Journal of Animal Ecology, v. 78, n. 1, p. 247-252, 2009. KUUSIK, A.; MARTIN, A. J.; MAND, M.; HIIESAAR, K.; METSPALU, L.; TARTES, U. Interrelations of gas exchange cycles, body movements and heartbeats in the foragers of bumblebee Bombus terrestris (Hymenoptera : Apidae) at low temperatures. European Journal of Entomology, v. 99, n. 2, p. 209-214, 2002. LUOTO, M.; PÖYRY, J.; HEIKKINEN, R.; SAARINEN, K. Uncertainty of bioclimate envelope models based on the geographical distribution of species. Global Ecology and Biogeography, v. 14, n. 6, p. 575-584, 2005. MACFARLANE, R.; GURR, L. Distribution of bumble bees in New Zealand. New Zealand Entomologist, v. 18, p. 29-36, 1995. MATSUMURA, C.; YOKOYAMA, J.; WASHITANI, I. Invasion status and potential ecological impacts of an invasive alien bumblebee, Bombus terrestris L.(Hymenoptera: Apidae) naturalized in Southern Hokkaido, Japan. Global Environmental Research, v. 8, n. 1, p. 51-66, 2004. MEDLEY, K. Niche shifts during the global invasion of the Asian tiger mosquito, Aedes albopictus Skuse (Culicidae), revealed by reciprocal distribution models. Global Ecology and Biogeography, v. 19, n. 1, p. 122-133, 2010. MORALES, C. Introducción de abejorros (Bombus) no nativos: causas, consecuencias ecológicas y perspectivas. Ecol. austral, v. 17, p. 51-65, 2007. MORANDIN, L. A.; LAVERTY, T. M.; KEVAN, P. G. Bumble bee (Hymenoptera: Apidae) activity and pollination levels in commercial tomato greenhouses. Journal of Economic Entomology, v. 94, n. 2, p. 462-467, 2001a. MORANDIN, L. A.; LAVERTY, T. M.; KEVAN, P. G.; KHOSLA, S.; SHIPP, L. Bumble bee (Hymenoptera: Apidae) activity and loss in commercial tomato greenhouses. Canadian Entomologist, v. 133, n. 6, p. 883-893, 2001b. PHILLIPS, S.; DUDÍK, M. Modeling of species distributions with Maxent: new extensions and a comprehensive evaluation. Ecography, v. 31, n. 2, p. 161-175, 2008. PLISCHUK, S.; LANGE, C. Invasive Bombus terrestris (Hymenoptera: Apidae) parasitized by a flagellate (Euglenozoa: Kinetoplastea) and a neogregarine (Apicomplexa: Neogregarinorida). Journal of Invertebrate Pathology, v. 102, n. 3, p. 263-265, 2009. RÖDDER, D.; SCHMIDTLEIN, S.; VEITH, M.; LÖTTERS, S. Alien invasive slider turtle in unpredicted habitat: a matter of niche shift or of predictors studied? PloS one, v. 4, n. 11, p. e7843, 2009. RUZ, L. Bee pollinators introduced to Chile: A review. In: KEVAN, P. G.; V.L., I.-F. (Ed.). Pollinating Bees: The Conservation Link between Agriculture and Nature. Brasília: Ministry of Environment, 2002. p. 155-167. RUZ, L.; HERRERA, R. Preliminary observations on foraging activities of Bombus dahlbomii and Bombus terrestris (hym : Apidae) on native and non-native vegetation in Chile. Acta Horticulturae, n. 561, p. 165-169, 2001. SCHMID-HEMPEL, P.; SCHMID-HEMPEL, R.; BRUNNER, P. C.; SEEMAN, O. D.; ALLEN, G. R. Invasion success of the bumblebee, Bombus terrestris, despite a drastic genetic bottleneck. Heredity, v. 99, p. 414-422, 2007. SEMMENS, T. D.; TURNER, E.; BUTTERMORE, R. Bombus terrestris (L.) (Hymenoptera: Apidae) now established in Tasmania. Journal of the Australian Entomological Society, v. 32, p. 346, 1993. STOUT, J. C.; ALLEN, J. A.; GOULSON, D. The influence of relative plant density and floral morphological complexity on the behaviour of bumblebees. Oecologia, v. 117, n. 4, p. 543-550, 1998. SWETS, J. Measuring the accuracy of diagnostic systems. Science, v. 240, n. 4857, p. 1285-1293, 1988. TORRETTA, J. P.; MEDAN, D.; ARAHAMOVICH, A. H. First record of the invasive bumblebee Bombus terrestris (L.) (Hymenoptera, Apidae) in Argentina. Transactions of the American Entomological Society, v. 132, n. 3-4, p. 285-289, 2006. VELTHUIS, H. H. W.; COBB, L. Pollination of Primula in a greenhouse using bumblebees. Acta Horticulturae, v. 288, p. 199-203, 1991. WALTHER-HELLWIG, K.; FRANKL, R. Foraging habitats and foraging distances of bumblebees, Bombus spp. (Hym., apidae), in an agricultural landscape. Journal of Applied Entomology, v. 124, n. 7-8, p. 299-306, 2000. WESTERKAMP, C. Honeybees are poor pollinators - why? Plant Systematics and Evolution, v. 177, n. 1, p. 71-75, 1991. WILSON, P.; THOMSON, J. D. Heterogeneity among floral visitors leads to discordance between removal and deposition of pollen. Ecology, v. 72, n. 4, p. 1503-1507, 1991. WINTER, K.; ADAMS, L.; THORP, R.; INOUYE, D.; DAY, L.; ASCHER, J. Importation of non-native bumble bees into North America: potential consequences of using Bombus terrestris and other non-native bumble bees for greenhouse crop pollination in Canada, Mexico, and the United States. White Paper of the North American Pollinator Protection Campaign (NAPPC), p.1-31, 2006. 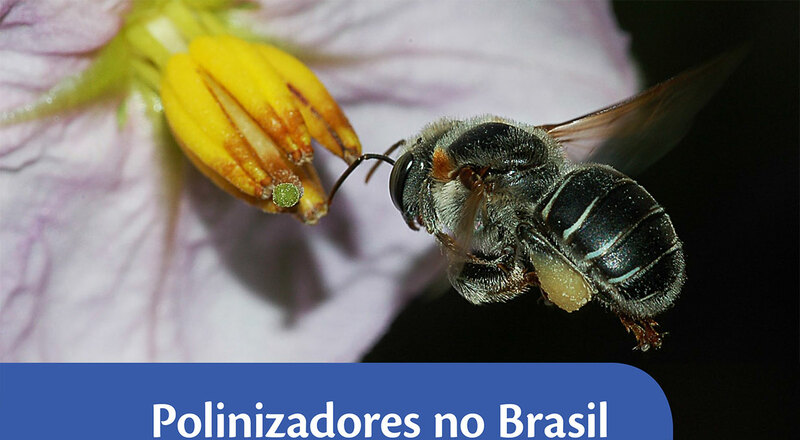 Disponível em: <http://www.pollinator.org/resources.BEEIMPORTATION_AUG2006.pdf>. WOLF, S.; MORITZ, R. F. A. Foraging distance in Bombus terrestris L. (Hymenoptera : Apidae). Apidologie, v. 39, n. 4, p. 419-427, 2008. ZURBUCHEN, A.; LANDERT, L.; KLAIBER, J.; MÜLLER, A.; HEIN, S.; DORN, S. Maximum foraging ranges in solitary bees: only few individuals have the capability to cover long foraging distances. Biological Conservation, v. 143, n. 3, p. 669-676, 2010.